We’ve had a pause in updates but work has continued on through the winter albeit a bit slower as the attention of the crew returned to the main house above the studio. We’re in the final stages now and I wanted to catch this thread up with progress since the last update. This time, our heroes ward off evil in the form of electrical interference! As mentioned earlier, Howard at Pro Audio Engineering designed our EMI abatement plan and it consisted of three components, each designed to address specific issues. We feed power to the studio via a dedicated Technical Power Panel (TPP) which is transformer-isolated from the main AC supply. A three-stage AC line filter and commercial TVSS (Transient Voltage Surge Suppression) round out this dedicated circuit to provide 7 KVA of clean 120 V technical power to the studio. In addition to the dedicated power circuit, a ferroucious one-two punch was delivered with a combination of metal shielding and magnetic paint. To prevent 60Hz power line and harmonic magnetic fields generated from the main house above, we ensured that any AC wiring above the studio was 3″ or more above the studio ceiling, and then covered the first layer of ceiling drywall with interlocking galvanized steel sheets. This is estimated to yield > 30dB attenuation of 60Hz radiated fields. The next item turned up by our RFI survey were high-frequency (100KHz to 1GHz) sources such as AM / FM radio stations and GSM and CDMA cell services. These were mitigated by applying EMI paint to all of the vertical surfaces, applying copper tape around the circumference of the studio, installing EMI shielded doors, and connecting everything above to a new technical ground point created just for the studio. All of this work did not stay visible for long. After the first layer of drywall and the aforementioned EMI abatement, the crew proceeded with two more layers of drywall to add to the acoustic isolation of the studio from the main house. 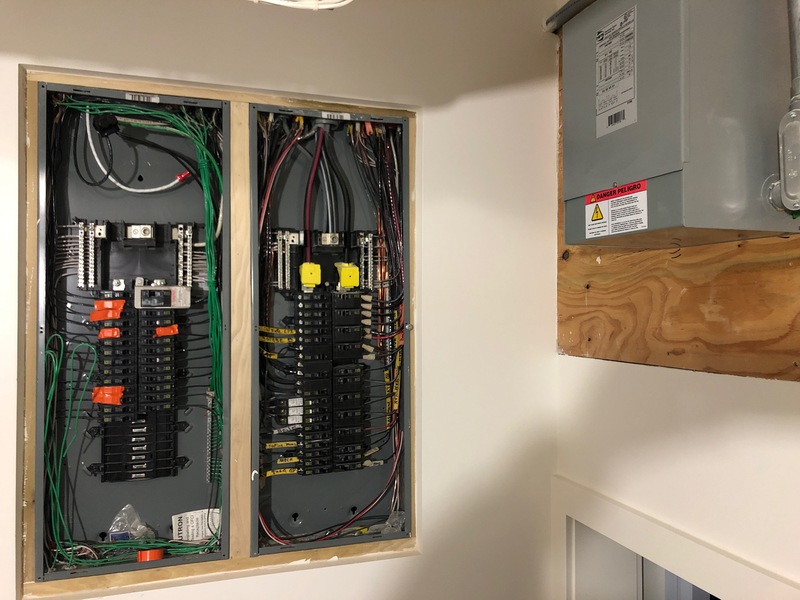 The folks at West Side Electric are doing a great job on the electrical subsystem and our construction crew at Olson and Jones continue to set the bar on the complicated ins-and-outs of this challenging project. That’s it for now, more updates next week! Previous PostPDX – Here we are!